After several decades of laser-focused readings and documentary viewings of aspects of World War II, I found myself confronted with some chronological and contextual challenges. Namely, when did x happen in relation to y, and how was it perceived in the contexts in the times, versus by historians in the 21st century? A representative example might be the role of Finland in World War II. Maps of the Nazi allies always show Finland as axis country - why? Were the Finns anti-semites and big fans of Hitler? (No - they hated the Soviet Union with a passion for a repelled late 30s invasion of their country). Another example: "The Battle of Britain" is rightly hailed as a huge milestone in defending the English people against Hitler - but when did it happen again? Before or after Hitler started bombing London in the "blitz"? (Before the blitz, and England's success in the air over the English channel helped steel that country for both the blitz and the perils of the larger war - changing history as we know it for the better as a result). 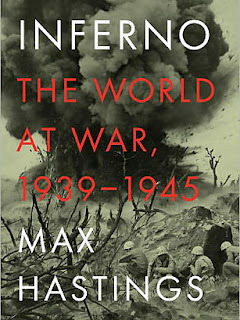 Being marginally familiar with the work of historian Max Hastings, I'd vowed to read one of his books one of these days - I always tell myself when I retire, I'll read all of the books, the ones by Hastings and everyone else - and then his single-volume World War II history "INFERNO: THE WORLD AT WAR 1939-1945" arrived in late 2011. (It's called "All Hell Lets Loose" in other parts of the world). I figured it was just the ticket to help me get a stronger grounding with the war - and if it was well-written and a compelling read, all the better. It was, without a doubt, all those things - and one of the strongest works of history I've ever read. It would be hard for me to recommend it any higher to both WWII buffs and novices alike. Like Tony Judt's "POSTWAR", which for obvious reasons picks up right where this one leaves off, it's a dense but amazingly approachable work of history, and I was quite honestly bummed out when I was done with it. Hastings tackles WWII with a number of biases that I'd hesitate to call biases - they're more "historian's prerogative". One prerogative is that a work of history like this one is more illuminated by real-time personal stories and narratives - here's what a besieged Leningrad girl wrote in her diary in 1942 - than it is by the historian's retroactive judgement on events. I happen to agree with this line of writing, as did Judt, and it really helps place many WWII actions and reactions in the context of the times. Examples include the US decision to drop nuclear weapons on Japan in 1945 and massive bombing of German cities such as Dresden and Hamburg by US and UK planes. It's not like Hastings doesn't use historical revisions and the unsealing of evidence over the years to his advantage and only relies on eyewitness, real-time judgment to tell stories; he supports the Japan decision and reviles the Germany bombings, for instance. Yet he's a master at threading chonological names-and-places history with recollections of people on the ground to then tell deeper stories, and while he may have his view on what was necessary and just, and what was simply cruel and barbaric, he presents history in such a way that gives all sides a voice - and that includes the non-Nazi Germans and the Soviet citizenry who were tormented by Stalin and Hitler and then Stalin again. Another prerogative of Hastings' is just how poorly we in the west have interpreted the bigger picture of the war over the years, in our zeal to tell great stories of American and British valor. Hastings, along with many modern historians, knows that World War II was primarily the story of the Soviet Union vs. Germany, and that the true war was won & lost in the bloodlands between those countries. I'm sure younger people among you, accustomed to a more thorough telling of history in the 1990s to today, might see that as pretty obvious. I was schooled in the 1970s, only thirty years after the war's end, and I knew much about the US and England's battles and decisions, but didn't even hear the word Stalingrad nor about the destruction of the Baltics, nor the many enormous battles in what's now Belarus and the Ukraine. Hastings covers the entire breadth of the war, including huge parts on the Asia Pacific theater, but he's very clear about the scale and the strategic importance of the Eastern front in determining the sort of world we all live in today. If you're on the fence about it, read (or listen to) this book, and I assure you you won't be much longer. Finally, it's the mark of a great writer and storyteller to be able to write a full single volume on a massive war and still haunt you viscerally with the sheer pain and horror suffered by so many. I had to stop on numerous occasions and contemplate the human stories of displacement; long marches to new lands; hideous and unimaginable starvation; the death of children; cannibalism; death camps and so on. Hastings, while capturing a litany of horrors along with his staid, chronological telling of the war, is careful to examine the human cost not just in lives, but in what the war did to human psyches: how it made otherwise good men barbaric killers, say, or how starvation drove Jewish prisoners or besieged Soviets to turn against one another. I know a lot of people say it and a lot of them say it often, but I can't believe this happened in the lifetimes of people still living. It seems like another world, another people, another age. Hastings reminds us time and again that this metaphorical "Inferno" exists not just in 1939-45, but in the hearts and minds of men both before and after that era as well.